As is typical of Conference Interpreting degrees, at Glendon College, one must pass oral exit exams in order to earn their credential. These exams have hung heavy over all of us since the day we said “yes” to this two-year crash course in vulnerability, falling short, and maintaining a sense of humor—a.k.a. conference interpreting. Exam day knocked at my door earlier this week, on a Tuesday. I woke up, got myself dressed in my current favorite vintage blouse that I rescued from my mother’s closet, drank an espresso, read a Spanish medical article on allergies out loud, interpreted Emma Watson’s speech on feminism, hopped on my bike and pedaled towards fate. Thirty minutes later I arrived at the Glendon College campus, inordinately early, where I began to speak in strings of vocabulary to no one in particular and then slowly walk in circles around the exam room, listening to my favorite Kevin Johansen instrumental that never fails to remind me that the world is much, MUCH vaster than we perceive on a daily basis. I was less afraid of failing the exams than underperforming. If I performed to the best of my current abilities and failed, well then that is valuable information. But a mediocre turn in the booth due to nerves, being sick, being tired, or just having an off day, well, that genre of near tragedy at a microcosmic level would follow me around—a tiresome thorn in my side for some time to come. Post-exam moment captured. That’s a smile ladies and gentleman. I won’t know the results of my exams for a few weeks. 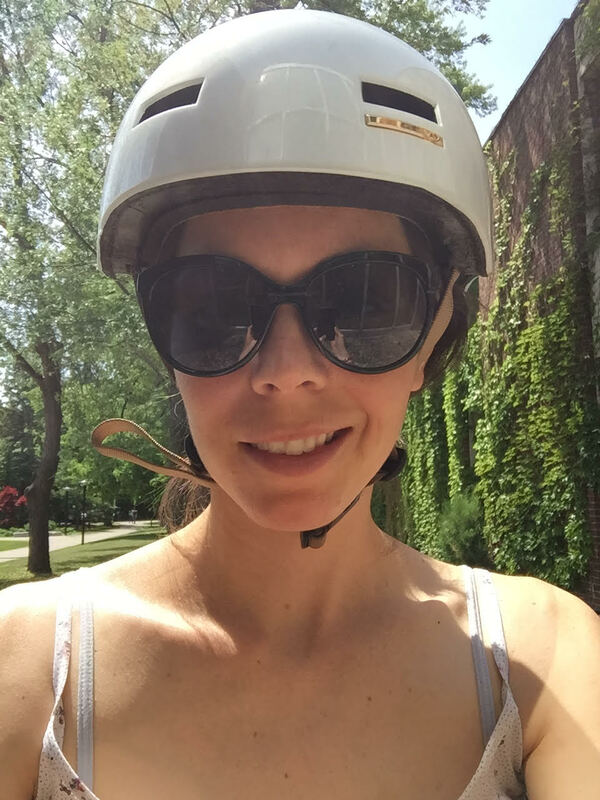 Tuesday afternoon I thanked my excellent team of professors and walked out of the lab and climbed onto my bike. I was content: an adjective that I rarely identify with. I pedaled back to where I came from, the wind at my back. Finally…FINALLY, I stand in that space where failure dovetails into success. Success on my terms, at least for the moment. This space, that feels so comforting, is the “this but also that”, it’s the “space in-between” that has always intrigued me. In fact, it’s what drew me to this impossible profession in the first place. Well I responded to your post immediately yesterday through word press and it did not send. So I will try to reconstruct. Laura, you are an amazing woman. A woman that can jump out of a cab in a busy intersection in Spain, try to wave down a bus and then, in pursuit, guiding a cab driver to successfully stop it a few blocks away, can do anything. You just don’t give up and your perspective on success and failure will see you through the most formidable storms. That is a beautiful quote, Jack. Thank you for taking the time to be with me in my writing. You and Carole have the clear and so appreciated talent of cheerleading. Your son has taught me a lot about ways to stick a bit closer to the axis. But what I’m grateful for, is that with time I become less afraid of straying from that axis, uncomfortable though it may be. See you very soon! Love this! How were today’s tests? Thanks for reading, Mom! I was a little less focused today, but no disasters. (a.k.a. success). Hi Laura! As a future interpreting student (who just got accepted to the MCI program at the University of Ottawa) I really appreciate your post and I can relate to it. I’m sure you did well in your exams and gave it your best shot. I can tell by your attitude that you’re heading in the right direction, no matter what. Best of luck to you in your future endeavors! I appreciate your kind words, Nadine. Congratulations on being accepted to the MCI. Best wishes for your experience in Ottawa, my dear.